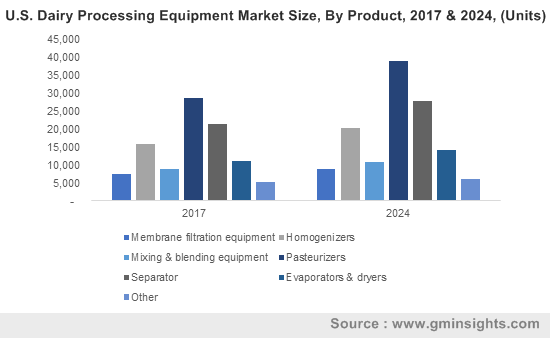 Dairy Processing Equipment Market size was over USD 9.15 billion in 2017 and industry expects consumption of above 800 thousand units by 2024. Increase in inclusion of milk products in daily dietary routine due to high nutritive value will drive the market size. Change in dietary patterns and demographic shifts has led to high consumption of cheese, cream and yogurt may boost product demand. Shifting trends towards balancing nutrition with flavour and variety products may act as a major contributing factor towards industry growth. Global milk and milk products market was 835 million tons in 2017. Increase in development of varied products to meet consumer taste, health needs and specification along with balancing the nutritive value and cost. Adoption of automation in dairy processing to reduce contamination & cost, increase efficiency along with meet required quality standards may favour industry growth. Specialised processes including ultrafiltration which facilitates recovery of milk solids. In addition, effective utilization of automated control systems resulted in processing effectiveness and achieve low fat, low sugar, cholesterol free products. Government initiatives supported by monetary assistance through subsidies for milk processing industry to promote milk goods consumption to provide nutrition resulted in high investments in technology innovation. Industrial adoptions like robotic expertise in milk processing to increase food shelf life and flexibility will propel dairy processing equipment industry growth. Milk & food processing is a labour-intensive industry which allots 50% of the product cost on labours. Automating repetitive task will cut down labour requirements along with improving quality control. Rising penetration of young generation accompanied by increase in consumption of fast food has led to rise in demand for cheese mainly in the U.S. Cheese making vats, vertical cheese press, and steam stretching machines are also used in production. The U.S. is the largest producer of cheese in the world, producing over 11 billion pounds. Growth in novel milk-based product formulations fortified with additional nutrition will have positive influence on dairy processing equipment demand. Huge investments in infrastructure, installation and maintenance may challenge industry profitability, thereby negatively impacting dairy processing equipment market price trend. In addition, waste generated in the form of waste water, solids waste and air pollution from milk processing industry will sustain additional regulatory cost along with sustainability measures for waste management which may incur additional cost acting as a major restraining factor. Pasteurizing equipment market size is anticipated to reach USD 4.25 billion at the end of 2024. This equipment helps to provide thermal treatment to the milk -based goods to make safe and increase shelf life by reducing spoilage. Pasteurization of yogurt milk denatures proteins enabling bacterial culture to develop which makes the product more viscous and stable. Growing consumer consciousness leading to consumption of milk foods for strengthening immune system, protection against osteoporosis and weight management may positively impact dairy processing equipment demand. Separator dairy processing equipment may have observed significant gains up to 4%. It is used to remove impurities and bacteria from milk. Cream separators breaks down the fat globules from milk separating skimmed milk and cream. Consumer focus towards health and weight management gave rise to low fat products demand which will stimulate product demand. Mixing & blending apparatus may witness strong gains owing to standardization requirements of milk and cream in terms of quality, fat content and fortification. Growing demand for milk powder, dry buttermilk, and dry blends owing to ease of storage, longer shelf life and convenience may raise dairy processing equipment demand. Dairy processing equipment market size from cheese application may exceed USD 4.8 billion in forecasted timeframe. Consumer inclination towards fast food supported by expansion of hotel and restaurant industry will surge cheese demand, thereby stimulating industry growth. Rising emphasis on convenience and prepacked cheese accompanied by easy availability in various consumer friendly form will drive cheese production owing to surging demand which may favour industry growth. Dairy processing equipment market size from yogurt application may show gains of over 3.5%. Homogenizers and pasteurizers are the prominent equipment for used for yogurt production. Rising demand for yogurt as a healthy replacement of desserts available in different tastes and flavours will boost market growth in this sector. Asia Pacific driven by India, Japan, South Korea and China market is estimated to exceed USD 4.7 billion in the forecasted timeframe owing to rising incidences of non-communicable disease including obesity, malnutrition, joint issues. Companies investing in product innovations to formulate milk food more palatable with enhance flavor and forms will have positive influence on regional product development. Europe driven by France, UK, Italy and Germany dairy processing equipment market may register strong gains over 3.5%. Stringent regulations pertaining to manufacturing and processing of milk - based products supported by quality standards has promoted use of efficient dairy equipment which may stimulate product demand. In addition, removal of milk quota by EU Common Agriculture Policy has promoted milk production in this region, thus stimulating processing equipment demand. Brazil dairy processing equipment market may witness steady gains due to rise in working population leading to increase in demand for convenience food to meet nutrition requirement will boost regional demand. 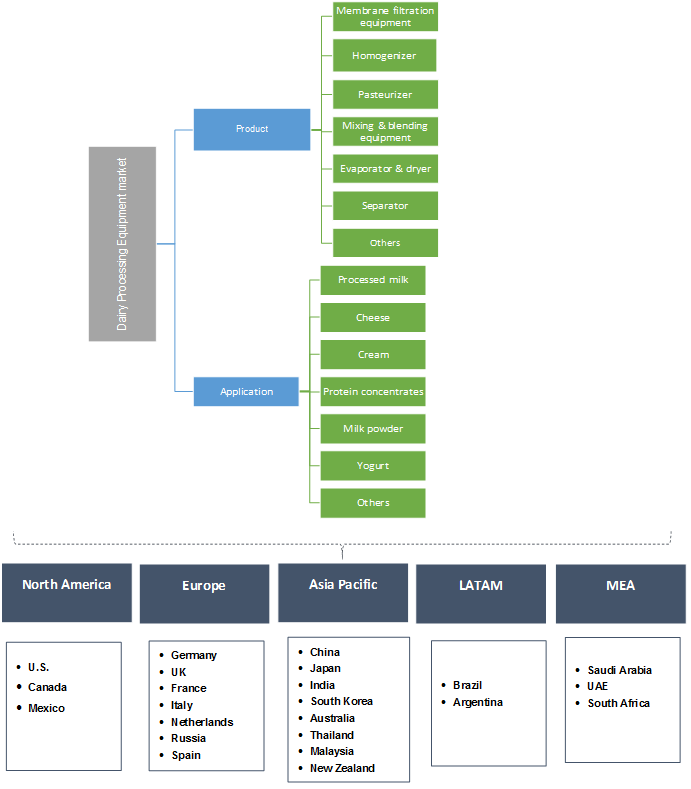 Global dairy processing equipment market share is competitive and fragmented with major players five companies including, GEA Group, The Krones Group, Tetra Laval International, A&B Processing and Alfa Laval Corp. Other key market players include IDMC, Feldmeier Equipment, SPX Corp., ISF Industries, and Agrometal Ltd. The market is characterised with technical innovation to reduce production cost along with formulating more stable and high-quality products. Companies are engaged in strategic alliances including capacity expansion, mergers and acquisitions to adopt different advance technologies and increase production to cater rising demand. Dairy processing equipment include milk based processed product manufacturing machinery such as pasteurizer, homogenizers, mixing & blending equipment, membrane filtration, separation, and evaporators & dryers which helps in production of high quality milk-based products including, yogurt, cheese, powdered milk, pasteurized milk, protein concentrates and cream. Rising global milk goods consumption & production rate accompanied with increase in automation process for manufacturing is anticipated to stimulate global dairy processing equipment industry growth.